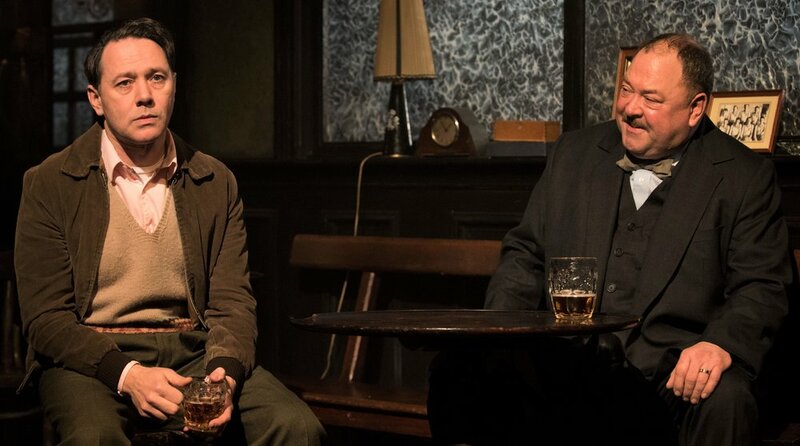 Hangmen is McDonagh’s first new drama in 12 years, and it shows that his talent for spinning a compelling plot hasn’t waned, but subtle changes have occurred. The story of the second-best hangman in England facing a personal crisis on the day the country has abolished hanging is weighted with more darkness than glee. McDonagh has always been able to turn things around on a dime to deliver a surprise, but here his writing, at least in Matthew Dunster’s production, doesn’t have the precision or balance of his earlier works. Reece Shearsmith (left) is Syd, the former assistant to hangman Harry Wade (Mark Addy) in Martin McDonagh’s Hangmen. Top from left: John Horton as Arthur, Johnny Flynn as Mooney and Owen Campbell as Clegg. But the execution is carried out, and the action moves to the day in 1965, two years later, on which hanging was abolished. Harry now owns a pub (beautifully evoked by designer Anna Fleischle with dark wood, smoky interior and frosted windows) in Lancashire, in the north of England. The regulars include Arthur, a nearly deaf pensioner; Fry, an alcoholic cop; Bill, who always puts his foot in his mouth; and the fairly normal Charlie, who explains conversations to Arthur. Shirley (Gaby French), plump, shy and 16, is keen to every slight. 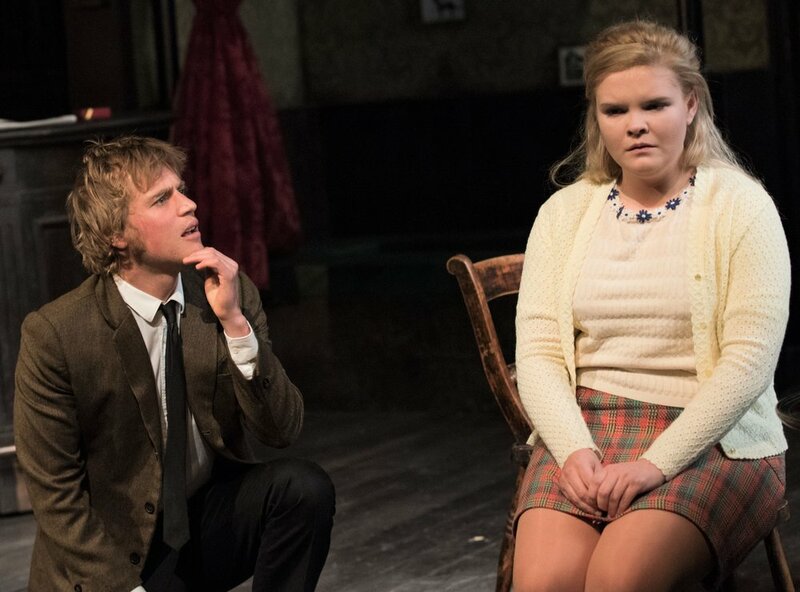 When a talkative, brusque stranger named Mooney (Johnny Flynn) turns up, he worms his way into her trust and arranges to meet her without her parents’ knowledge, ostensibly to take her to an asylum where her teenage friend has been committed. But Shirley doesn’t come home that night, and Harry is troubled by the knowledge that a young woman has been murdered in a way that bears the hallmarks of the killing Hennessy died for. Did they get the right man? Is he at large, and has he taken Shirley? And isn’t Mooney the likely suspect? Flynn with Gaby French as Shirley. Photographs by Ahron R. Foster. McDonagh spins a black tale out of all this, including the rivalry between the irascible Harry and Pierrepoint, embodied briefly but commandingly by Maxwell Caulfield. The enmity produces McDonagh’s trademark black humor, as Harry complains to Clegg about Pierrepoint’s body count: “Everyone knows Albert Pierrepoint did shitloads, but Pierrepoint did a shitload of Germans both during and after the war, so there should be a bit of an asterisk against some of his numbers at the very least.” And the incompetent Syd, gay and sacked for a vaguely necrophiliac act, also turns up. But the play hinges on whether Mooney, who describes himself as “menacing,” has done away with Shirley. Johnny Flynn certainly gets the menace right, but his extended speeches—almost arias—run to implausible lengths. It’s a showy part, but ultimately the writing in his scenes undercuts credibility. Meanwhile, Harry, full of himself, has his own failures as husband and parent shamefully exposed. Addy is terrific in navigating the bluster, the comic delivery, and the cruelty of his character—he’s like a British Ralph Kramden, holding one’s sympathy but going to far darker places than The Honeymooners ever did. Hangmen may not be McDonagh quite at the top of his game, but as usual he provides a good deal of pleasure, and fans won’t want to miss it. The Royal Court Theatre production of Hangmen plays through March 7 at the Atlantic Theater Company (336 W. 20th St.). Evening performances are at 7 p.m. Sunday and Tuesday and 8 p.m. Wednesday through Saturday; matinees are at 2 p.m. Saturday and Sunday. For tickets, call OvationTix at (866) 811-4111 or visit atlantictheater.org. The run is sold out, but returned tickets are available, and a transfer to Broadway’s Cort Theater has been announced.